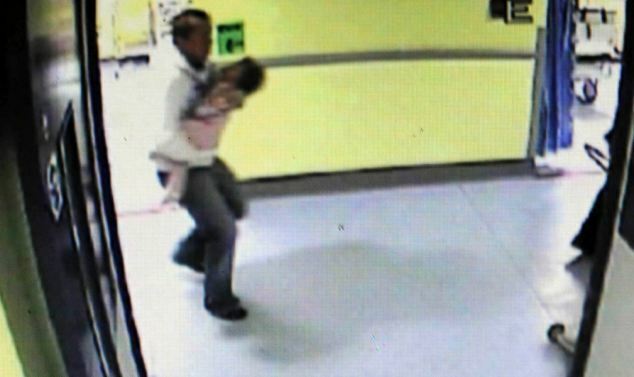 Cradled in his arms, Barry McCarney is caught on CCTV desperately trying to bring his girlfriend's dying daughter back to life. But the haunting footage, captured in Erne Hospital, in Northern Ireland, disguises the horrific reality of what has just happened. 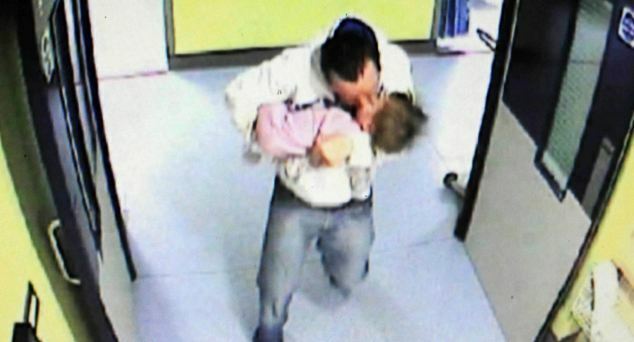 McCarney is no desperate father giving the kiss of life to his 15-month-old step-child. Instead, he is the perverted monster who abused Millie Martin so badly that she died of her injuries. McCarney, from County Tyrone, met Millie's mother Rachael Martin just three months before the little girl's death. He quickly eased his way into the family home in Enniskillen which allowed him access to Millie. During a ten-week trial, the court heard how he had physically and sexually abused the toddler until she was left with a number of fatal injuries, including the head wound that killed her. pathologist found that Millie had suffered 21 cracked ribs, seven of which were old, while the rest had happened in the ten days before her death. 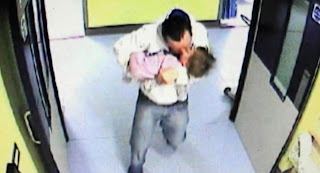 Multiple bruises were also found on the youngster's body along with a clearly visible oval shaped bump on her forehead. During the post-mortem examination, the pathologist found injuries to her abdomen caused by punching or prodding which would also have been fatal. Millie had also been sexually assaulted.The prosecution described the attacks on her as vile and sadistic. McCarney blamed Millie's mother Rachael, claiming at trial that she had inflicted the injuries on her own daughter and that he was sickened by her death. Speaking only through his barrister, he alleged that Ms Martin did not want social services involved because she had done these 'terrible things' herself. But in a case with no forensic evidence to suggest who inflicted Millie's injuries, the jury rejected McCarney's claims and accepted that Ms Martin had unwittingly let a monster into her home, taking just three hours to reach a unanimous verdict. 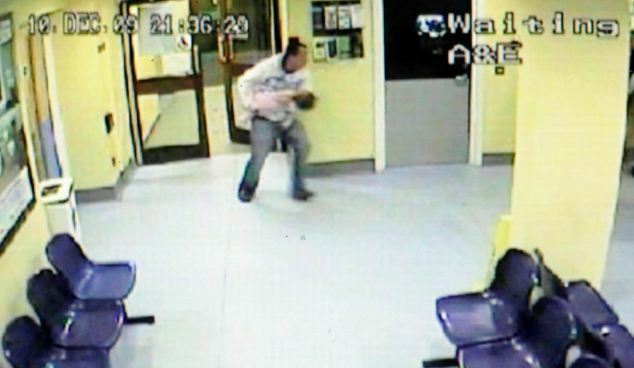 He was found guilty of murder, sexual assault and causing grievous bodily harm. Ms Martin sobbed as she was cleared of allowing her daughter's death through willful neglect. She was heard to say that justice had been done for her daughter. McCarney's relatives shouted 'innocent' as they left the courtroom. Meanwhile Ms Martin's family issued a statement saying the family would now be able to grieve properly as a result of the verdict. They described the last three years as a 'waking nightmare' and described McCarney as a 'disgusting individual'. They also questioned why Ms Martin was ever prosecuted in the first place. Her brother, Matthew, speaking on behalf of the family said the police decision to prosecute her was 'shocking' at a time when she should have been left to grieve for Baby Millie. McCarney will be sentenced in the New Year. Neil Anderson, head of the NSPCC, said Millie will be remembered as the victim of 'one of the most horrific cases of child abuse Northern Ireland has ever seen'. He added: 'One clear message from this deeply disturbing case is the need for vigilance among healthcare professionals, family, friends, neighbours and the community as a whole.